The Bonn climate session ended on May 26 without making any significant progress, five months after the Paris Agreement was adopted in December 2015. The mandate of the Bonn session was to start the implementation of the Paris Agreement. This was to be done under three bodies: Subsidiary Body for Implementation (SBI), Subsidiary Body for Scientific and Technological Advice (SBSTA) and the first session of the Ad-hoc Working Group on Paris Agreement (APA) which would flesh out the modalities, technicalities and establish guidelines and rules under different elements of the Paris Agreement. During the discussions, the divide between the developed and developing countries over interpretation of the various provisions was clearly visible. On the critical issues of transparency framework, global stock take meant to assess collective progress, compliance and implementation of the Paris Agreement, developing countries argued for differentiation to be maintained in these issues while developed countries were against it. There is as yet no agreement and discussions are to be taken forward at the next Conference of Parties (CoP) at Marrakesh, Morocco in December. Additionally, it was witnessed that developed countries focused more on mitigation issues while adaptation issues struggled to acquire similar importance. The devastating impacts of climate change witnessed across the globe underscores the need for swift climate actions. 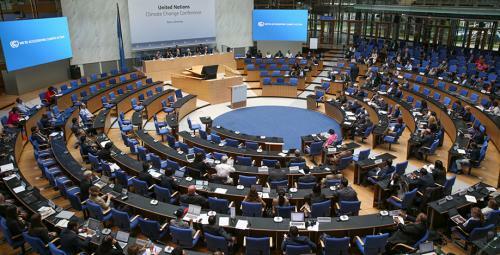 However, the Bonn session did not witness that urgency and drive. Adaptation and Loss and Damage: The first week was lost to just adopting the agenda under the APA as it (the agenda) was not balanced and adaptation was not properly reflected. The focus of the developed countries was mitigation-centric. Developing countries worked hard to restore balance into the agenda after which it was adopted. No significant discussions were held on the issue of adaptation. Under SBI, developing countries fought for inclusion of a separate registry for communications of adaptation efforts by the Parties. Loss and Damage was a highly neglected issue in the entire Bonn agenda. Finance: There were no substantial discussions on this issue which is extremely critical to developing countries. Under the Paris Decisions text, Parties need to devise a work programme for the operationalisation of USD 100 billion by 2020. Pre-2020 actions: Practically no outcomes came on the need for developed countries to comply with their existing obligations for the pre-2020 period and also to upscale their existing commitments. Redd+ and Market Mechanisms: Parties could not arrive at a conclusion on issues related to finance, leakage, accounting methodologies and base line with regard to forestry and land. Discussions on market mechanism remained at a preliminary stage. There was no definition or understanding of what the sustainable development mechanism implied in relation to market mechanism as enshrined in the Paris Agreement.